But, just like any blissfully happy honeymoon period in a relationship, sometimes the magic doesn’t last on the job. Sometimes there’s an unfavorable change in leadership. Sometimes your favorite roles and responsibilities get delegated to someone else. Sometimes you find yourself in the middle of untenable office politics. And, sometimes you simply plateau and wake up one day feeling underutilized, undervalued, and underappreciated. What do you do when you’ve lost that loving feeling for your job? Of course, you can dust off your resume, freshen up your LinkedIn profile, and look for another job, but that’s not always the best, or most realistic, answer. There are many other steps you can take to try and reignite that initial passion you had when you started. If you’ve hit a wall and are feeling bored and no longer challenged by your job, most people isolate themselves and stop working. Not literally, but there is definitely a dip in motivation and productivity. To relight that spark, this is the time to re-engage at full force… join committees, help out co-workers, assume additional responsibilities, start an office book club, find someone to mentor, write the manual that’s been on everyone’s to-do list forever, or participate in the office 5K run for charity. If you need a boost of energy to remind yourself why you accepted that job offer in the first place, then the best thing to do is get involved, get engaged, get inspired, get energized, and get back to work. It’s Darwinism and basic common sense that if you’re not growing and evolving, you’re dying. And, as adults, the only way we grow and learn is when we feel uncomfortable. The seductive lure of the comfort zone is often the reason why we fall out of love with what we do. If you’re not being strongly encouraged to participate in structured and scheduled professional development and or training activities, then it’s up to you to take the bull by the horns. Invest in yourself and sign up for relevant workshops and seminars (Women ON Point, for example), watch a webinar, read books and blogs by your industry leaders, go listen to a dynamic speaker, join professional associations, or sit on a board. You can’t always rely on someone else to know exactly what you need. If you’re lacking interest and inspiration, then invest time and resources in yourself and go find it. Some people are incredibly fortunate and believe they are doing exactly what they were born to do. They wake up every morning with a pep in their step, a clear purpose in their hearts, and an abundance of love and passion for what they do. But that’s not true for everyone. If you don’t fall into that fortunate category, it doesn’t mean you forfeit and forgo passion and purpose completely. All it means is that you need to find it someplace else and bring all that love back to your workplace. As much as we’d like to think we can separate our personal and professional lives, we’re still just one fully integrated person. If you love gardening, climbing mountains, caring for animals, writing screenplays, cooking and entertaining, traveling, learning new languages, or spending quality time with close friends and family, then you need to find a way to do that as often as possible. Identify what feeds your soul what makes you happy outside of work, and allow all of that joy, happiness, and passion to fill your heart and follow you back to work. 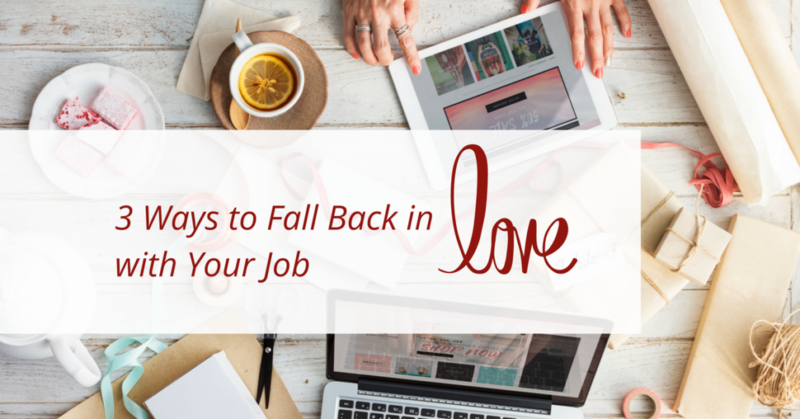 Falling in love is often easier than staying in love, and the same is true for the love you have for your career. If you’ve lost that loving feeling, then it’s up to you to find a way to reignite the flame. The love affair you have with your career is a marathon, not a sprint. You’re going to have good times and bad, highs and lows, and a million mind-blowing and mind-numbing moments. Keeping the love alive for what you do isn’t always easy, but it’s always worth it.